Charles was William’s younger brother. When young Edward Fraser of Reelig arrived in Guyana in 1803, one of the first people he met was a Charles Robertson, who invited him to his brother’s house on Leguan Island [NRAS 2696]. In the same week as William died in 1815, Charles Lamont Robertson announced his intention to leave the colony [E&DRG 31 Jan 1815]. In March 1815 the published list of those quitting the colony included ‘Mrs. Robertson (widow of the late Hon. W. Robertson) and Family, and a Servant’. The family included a son, A (Alexander?) J Robertson [1799-1825] and three daughters, all born in Demerara: Mary Nicholson born c 1808, Amelia Lamont Boyd born c1809 and Georgina Esther born c1812 [Census returns]. From the names of the daughters it is likely that William's widow was a Nicholson. A J Robertson became a doctor in the East India Company’s Bombay establishment and died on his passage back from India in 1825 [Asiatic Journal 1825]; Mary [Annual Register 1834] and Amelia [The Gentleman’s Magazine 1835] married into army families, while Georgina remained single, and all three sisters were living in the same household in Somerset in 1871, where Mary’s son was vice-principal of Wells Theological College [Census returns]. Charles Lamont Robertson left the colony in 1815 and lived in Inverness where he was known as ‘Dandy Charlie’: He had no profession but still managed to appear in immaculate suits, whatever the season. He was best known for his outfit of white waistcoat and trousers, light-coloured gloves and light umbrella . . . The Exchange [the paved area in front of the Town House] was one of the three favourite places of rendezvous for a band of gentlemen without any profession or occupation, who met regularly every afternoon to discuss the news and take note of the passers-by. Among them were the Laird of Culduthel, the Laird of Inshes, Doctor Hugh Fraser, and Mr. Charles Lamont Robertson (commonly known as "Dandy Charlie " on account of his finical neatness). He had no profession but still managed to appear in immaculate suits, whatever the season. He was best known for his outfit of white waistcoat and trousers, light-coloured gloves and light umbrella. Charles Robertson was born in Cambeltown, Argyll, in 1783 and died in Inverness in 1866. His father was Alexander Robertson [1733-1820], Collector of Excise, and his mother was Amelia Lamont [death certificate of Charles Lamont Robertson, GROS 098/00 0243]. 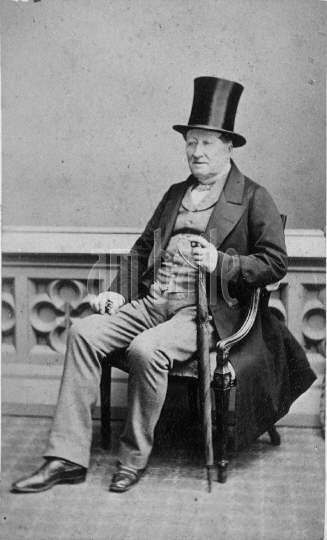 Their elder brother, Dr James Robertson (1766-1847) of Aultnaskiach, was for many years a member of Inverness Town Council. He served as Provost from 1816-18, 1824-27 and 1829-31.